A High-Level Meeting on HIV/AIDS will take place at the United Nations in New York from 8 to 10 of June 2016, “which will undertake a comprehensive review of the progress achieved in realizing the Declaration of Commitment on HIV/AIDS and the Political Declarations on HIV/AIDS of 2006 and 2011 including successes, best practices, lessons learned, obstacles and gaps, challenges and opportunities”. Our speakers EriKa Castellanos and Maurine Murenga were invited to be part of one of five thematic sessions for the day, entitled “Financing the AIDS Response and the Cost of Inaction”. EriKa’s speech focused on investments in key populations while Maurine focused on the importance of women and girls. 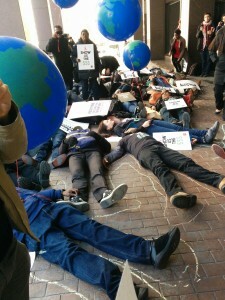 Both speeches made a plea for donors to continue to fully support the Global Fund’s work with the financing it needs. All interventions from speakers and the floor will be included in an official record and taken into consideration for the outcome document by the co-facilitators of the High-Level Meeting. Our speaker Anton Basenko also played a role as a member of the Stakeholders Task Force that provides an important link for civil society and all relevant stakeholders interested in participating in the High Level Meeting and is working with UNAIDS and the President of the General Assembly in developing key aspects of the High-Level Meeting. Find out more about the High-Level Meeting on UNAIDS’ and ICASO’s websites. 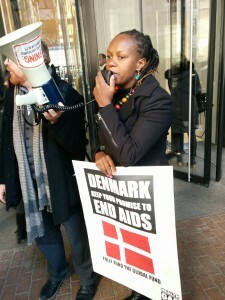 Our speakers and partners, including GFAN Africa and Health GAP, also took part in a protest during the lunch break at the Danish consulate calling on the government to reinstate its cuts of USD$20million per year for 2015-2016 to the Global Fund. 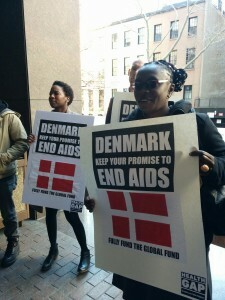 Back in October 2015, 90 NGOs worldwide signed a petition that called on the Danish government to reverse the cuts to funding to HIV/AIDS, including to the Global Fund and civil society organizations. A similar outcry occurred against Sweden’s planned cuts which led to almost 160 organizations signing a petition that featured heavily in Swedish news outlets.